THE TERMS AND CONDITIONS SET FORTH BELOW (THE "TERMS") GOVERN YOUR USE OF THIS SITE LOCATED AT WWW.PROI.COM ON THE WORLD WIDE WEB (THE "SITE") OF PUBLIC RELATIONS ORGANISATION INTERNATIONAL ("PROI"), AND ARE LEGALLY BINDING ON YOU. IF YOU DO NOT AGREE WITH ANY OF THESE TERMS, DO NOT ACCESS OR OTHERWISE USE THIS SITE OR ANY INFORMATION CONTAINED ON THE SITE. YOUR USE OF THE SITE SHALL BE DEEMED TO BE YOUR AGREEMENT TO ABIDE BY EACH OF THE TERMS SET FORTH BELOW. All information, documents, products, software and services provided on this Site, including trademarks, logos, graphics and images (collectively the "Materials") are provided to you by PROI. PROI grants you the limited right to display the Materials only on your personal computer, and to copy and download the Materials displayed on this Site, provided that: (1) both the PROI copyright notice ("Public Relations Organisation International © 2002, 2003, 2004, 2005) and the permission notice, set forth in this paragraph, appear in the Materials so displayed, copied or downloaded, (2) such display, copy or download is solely for your personal or internal informational use (that is, not distributed or otherwise transmitted outside of your home or company, or otherwise broadcast in any media) and (3) your use complies with any other license terms that are provided with respective portions of the Materials. You acknowledge and agree that you have no right to modify, edit, alter, distribute, publicly perform, display or enhance any of the Materials in any manner. This limited license terminates automatically, without notice to you, if you breach any of these Terms. Upon termination of this limited license, you agree to immediately destroy any downloaded and printed Materials. Except as stated herein, you acknowledge that you have no right, title or interest in or to the Materials on any legal basis, without the advance written authorization of PROI. You agree not to "frame" or "mirror" any Materials or Third Party Content contained on or accessible from this Site on any other server or Internet-based device without the advance written authorization of PROI or its licensors, respectively. In your use of the Site, you may enter into correspondence with, purchase goods and/or services, or participate in promotions of advertisers or members or sponsors showing their goods and/or services on or advertised through the Site. Unless otherwise stated, any such correspondence, purchase or promotion, including the delivery of and the payment for goods and/or services, and any other term, condition, warranty or representation associated with such correspondence, purchase or promotion, is solely between you and the applicable third party. You agree that PROI has no liability, obligation or responsibility for any such correspondence, purchase or promotion between you and any such third party. Restricted Areas of the Site. Certain functions of the Site are restricted to authorized users or require you to provide personal information ("Restricted Areas"). If you are an authorized user of the Restricted Areas, you agree that you are entirely responsible for maintaining the confidentiality of your password or your employees' passwords and account information, if any, and agree to notify PROI if the password is lost, stolen, disclosed to an unauthorized third party, or otherwise may have been compromised. You agree that you are entirely responsible for any and all activities which occur under your account, including any fees which may be incurred under your password-protected account, whether or not you are the individual who undertakes such activities. You agree to immediately notify PROI of any unauthorized use of your account or any other breach of security in relation to the Site known to you. You acknowledge that your unauthorized use of any Materials or Third Party Content contained on this Site may violate copyright laws, trademark laws, the laws of privacy and publicity, certain communications statutes and regulations and other applicable laws and regulations, and agree that you are wholly responsible for your actions or the actions of any person using your screen name and/or password. As such, you agree to hold PROI entirely harmless from and against any and all costs, damages, liabilities, and expenses (including attorneys' fees) incurred by PROI in relation to, arising from or for the purpose of avoiding any claim or demand from a third party that your use of the Site or the use of the Site by any person using your screen name and/or password (including without limitation your participation in any chat rooms) violates any applicable law or regulation, or the rights of any third party. All PROI trademarks, marks, names, service marks and logos are the property of PROI and their respective owners. All information and screens appearing on this Site including documents, products, software and services, graphics, text elements, Site design, logos, images, and icons, as well as the selection, assembly, and arrangement thereof, are the sole property of PROI, Copyright © 2002, 2003, 2004, 2005 Public Relations Organisation International, unless otherwise specified. All rights not expressly granted herein are reserved. Except as otherwise required by applicable law, any reproduction, distribution, modification, retransmission, or publication of any copyrighted material is strictly prohibited without the express written consent of the copyright owner. You acknowledge and agree that this Site may include certain errors, omissions, outdated information which may affect the quality of the Materials and the Third Party Content. You acknowledge that neither the Materials nor the Third Party Content have been independently verified or authenticated in whole or in part by PROI, and agree that PROI does not warrant the accuracy or timeliness of the Materials or the Third Party Content, and further agree that PROI has no liability for any errors or omissions in the Materials and the Third Party Content, whether provided by PROI or its licensors. PROI, FOR ITSELF AND EACH OF ITS LICENSORS, MAKES NO REPRESENTATIONS, WARRANTIES, OR GUARANTEES AS TO THE QUALITY, SUITABILITY, TRUTH, ACCURACY OR COMPLETENESS OF ANY INFORMATION OR MATERIAL CONTAINED ON THE SITE, INCLUDING WITHOUT LIMITATION THE MATERIALS AND THE THIRD PARTY CONTENT. UNLESS OTHERWISE EXPLICITLY STATED, TO THE MAXIMUM EXTENT PERMITTED BY APPLICABLE LAW, THE SITE AND ANY INFORMATION OR MATERIAL CONTAINED ON THE SITE IS PROVIDED TO YOU ON AN "AS IS" AND "WHERE-IS" BASIS, AND IS FOR PERSONAL USE ONLY. ALL CONDITIONS, REPRESENTATIONS AND WARRANTIES, WHETHER EXPRESS, IMPLIED, STATUTORY OR OTHERWISE, INCLUDING ANY IMPLIED WARRANTY OF MERCHANTABILITY, FITNESS FOR A PARTICULAR PURPOSE, OR NON-INFRINGEMENT OF THIRD PARTY RIGHTS, ARE HEREBY DISCLAIMED. TO THE MAXIMUM EXTENT PERMITTED BY APPLICABLE LAW, PROI SHALL NOT BE LIABLE TO YOU OR A THIRD PARTY CLAIMING THROUGH YOU FOR ANY DAMAGES OR LIABILITIES SUFFERED AS A RESULT OF YOUR DISPLAYING, COPYING, OR DOWNLOADING ANY INFORMATION, OR MATERIAL OR THIRD PARTY CONTENT CONTAINED ON THE SITE. IN NO EVENT SHALL PROI BE LIABLE TO YOU OR ANY THIRD PARTY FOR ANY INDIRECT, EXTRAORDINARY, EXEMPLARY, PUNITIVE, SPECIAL, INCIDENTAL, OR CONSEQUENTIAL DAMAGES (INCLUDING LOSS OF DATA, REVENUE, PROFITS, USE OR OTHER ECONOMIC ADVANTAGE) HOWEVER ARISING, WHETHER FOR BREACH OR IN TORT, EVEN IF PROI HAS BEEN PREVIOUSLY ADVISED OF THE POSSIBILITY OF SUCH DAMAGE. PROI controls and operates this Site from its headquarters in the United States of America and makes no representation that the Materials are appropriate or will be available for use in other locations. If you use this Site from outside the United States of America, you are entirely responsible for compliance with applicable local laws, including but not limited to the export and import regulations of other countries in relation to the Materials and the Third Party Content. 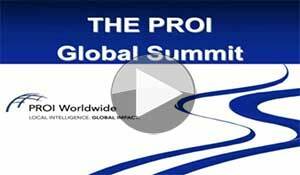 PROI does not monitor your data or transmissions, yet, PROI does actively monitor accounts for system utilization. However, you agree that, in PROI's efforts to promote good citizenship within the Internet community, if PROI becomes aware of inappropriate use of the Site or any PROI service, PROI may respond. You acknowledge that PROI will report to law enforcement authorities any actions which may be considered illegal, as well as any reports it receives of such conduct. When requested, PROI will cooperate fully with law enforcement agencies in any investigation of alleged illegal activity on the Internet. If you violate these Terms, PROI reserves the right to terminate your ability to use the Site without notice. In addition, you agree to terminate your use of the Site upon request. PROI's preferred course of action is to advise you of your inappropriate behaviour and recommend any necessary corrective action. You agree that PROI can revise these Terms at any time without notice by updating this posting on the Site. You agree that your continued use of the Site after such modifications have been made constitutes your acceptance of such revised Terms. If any provision of these Terms is held by a court of competent jurisdiction to be contrary to law, then such provision(s) shall be construed, as nearly as possible, to reflect the intentions of the parties, with all other provisions remaining in full force and effect. The failure of PROI to enforce any right or provision in these Terms shall not constitute a waiver of such right or provision unless acknowledged and agreed to by PROI in writing. The Terms comprises the entire agreement between you and PROI and supersede all prior or contemporaneous negotiations, discussions or agreements, if any, between the parties regarding the subject matter contained herein.